MOSCOW, Russia -- It may have been the last note Boris Nemtsov ever wrote, a hurried scrawl in blue pen on a plain white sheet of A4 paper. A visitor holds flowers and a book ''Confessions of the Rebel'' by Russian leading opposition figure Boris Nemtsov while waiting to attend a memorial service before the funeral of Nemtsov in Moscow, March 3, 2015. A day before he was shot dead near the Kremlin last week, the Russian opposition figure and his close aide Olga Shorina were discussing a sensitive investigation he was preparing into Moscow's backing for separatist fighters in eastern Ukraine. "Some paratroopers from Ivanovo have got in touch with me. 17 killed, they didn't give them their money, but for now they are frightened to talk," said the note, shown to Reuters by Shorina. "He did not want to say anything, just in case. He did not want to utter it out loud, which is why he wrote it down for me," she said. That is why Nemtsov's last report was so sensitive - perhaps sensitive enough, according to some of his friends, to provide at least part of the motive for killing him, though they say they doubt it was the main reason. He was the most prominent opposition figure to be killed during President Vladimir Putin's 15-year rule. The president has called his death a shameful tragedy, and the Kremlin has denied any involvement. 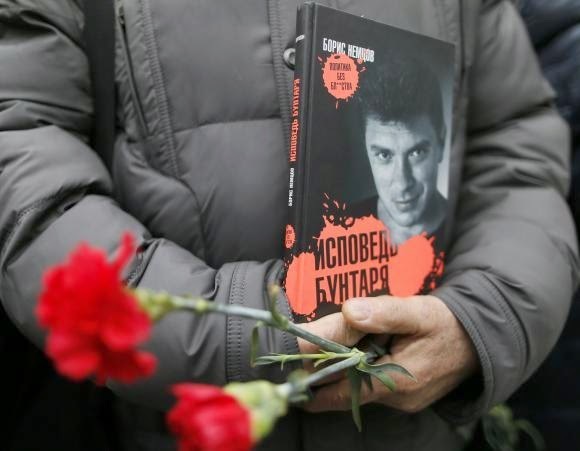 Nemtsov was part of a liberal opposition which is supported only by a minority of Russians. He was almost never given air-time on state-run television and radio. The publication of his report was therefore not likely to resonate with the wider public, which polls show backs Putin's policy on Ukraine. But Shorina said he had been planning to publish 1 million copies, to reach as wide an audience as possible. In a campaign over many years to expose what he saw as Putin's misrule, Nemtsov had previously published eight reports, including investigations into alleged corruption surrounding last year's Sochi Winter Olympics and into assets owned by the president and his circle. However, she said in the course of research he had been contacted by relatives of a group of Russian soldiers who, according to Nemtsov, had been in action in eastern Ukraine. He was trying to persuade them to make their accounts public. These were the servicemen who according to Nemtsov's note were based in Ivanovo, a city about 300 km (185 miles) north-east of Moscow which is home to units of the Russian military's 98th paratroop division. "He was maintaining contact with them," Shorina said. "How he was maintaining contact with them, I don't know, he did not put me in touch with anyone." Shorina said she and another Nemtsov associate, Ilya Yashin, would try to salvage the information Nemtsov had been gathering and attempt to publish the report in a month. As far as she was aware, he had only managed to write down a table of contents. "He told me he had been in touch with relatives of Russian soldiers killed there and he was planning a trip to Ivanovo to talk to the parents of those killed soldiers," Yashin said. "He said in the very near future he was going to assemble and put in order various evidence and documents directly proving the presence of the Russian military on the territory of Ukraine and, accordingly, (exposing) President's Putin's lies that there are no Russian servicemen there." Nemtsov had also settled on a title for the report, Yashin said. He was planning to call it: "Putin and the War".